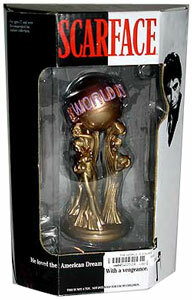 Description Of Item: Exact replica from the desk of Tony Montana - the infamous The World Is Yours mini statue. The highly detailed poly resin statue has a gold metallic finish and stands approximately 10-Inch tall. This statue looks incredible! You will definitely love this item if you are a fan of Scarface! Considered the ultimate gangster film?an unforgettable portrayal of money, power and extravagance?Scarface is best remembered by Al Pacino's classic performance as the ruthless Tony Montana. First released to theaters in 1983, this gripping crime epic transcends generations and continues to influence popular culture today.